티로스의 포르피리오스(고대 그리스어: Πορφύριος, 234~305? )는 3세기의 신플라톤주의 철학자로, 티로스 섬에서 태어났다. 그는 신플라톤주의의 창시자인 자신의 스승 플로티노스의 사상을 집대성한 논문집인 《엔네아데스》를 출판하였다. 또한 많은 저작을 남겼는데, 그가 다룬 주제들은 호메로스 서사시와 같은 서양 고전으로부터 철학, 논리학, 수학의 학문들과 기독교와 미트라교 등의 종교와 채식주의에 이르기까지 광대하고 다양하였다. 그의 저서 《입문서(Εἰσαγωγή Isagoge)》는 논리학과 철학에 관한 입문서로서, 이 책의 라틴어 번역본은 중세 논리학 교과서의 표준이 되었다. 유클리드의 《원론》에 대한 포르피리오스의 주해는 알렉산드리아의 파푸스에 의해 인용되기도 하였다. 또한, 포르피리오스는 자신의 저작들 중 대여섯 저작들, 그 중에서도 특히 《신탁에서 유래한 철학(Philosophy from Oracles)》과 《기독교에 대한 반론(Against the Christians)》으로 인해, 많은 초기 기독교인들과 논쟁을 벌여야 했다. 그의 저서 《님프의 동굴에 대하여(De antro nympharum)》에는 로마 제국 시대의 신비 종교였던 미트라 신비 가르침의 기원에 대한 내용이 들어있다. 페니키아의 무역도시 티로스의 부유한 가정에서 태어났다. 그는 우선 당시의 풍습대로 아테네에 유학하여 롱기누스에게 배웠다. 그 후 로마로 나가, 플로티노스와의 해후(解逅)로 그에게 쏠려 문하에 들어갔다. 스승의 논문을 정리하여 《엔네아데스》를 편집하고 스승의 학설 보급에 진력하였다. 그는 다방면에 걸쳐서 저작을 했다고 전하는데, 그 태반은 단편적으로 전해지는 데 불과하다. 그는 채식주의자였다고 전하며, 그 관점에서 《육식의 기피(忌避)에 관하여》를 내놓았다. 또 기독교를 적대시하여(그리스도를 적대시 한 것은 아니다) 《기독교에 대한 반론》을 저술하였다. 그는 만년에 여섯 아이를 가진 미망인 마르셀라와 결혼하였으나 그녀에게 보낸 서간에는 그의 이교(異敎)의 제신(諸神)에 대한 경건한 심정이 나타나 있다. 그 밖에 호메로스의 시 해석이나 아리스토텔레스의 논리학 관계 저서의 주해와 입문서 등이 있다. ↑ 더 포괄적인 목록에 대해서는 Beutler (1894-1980)를 참조하시오. ↑ Barnes 2003, p. xv. 더 명확하게 하자면, "(It was) not an Introduction to the ‘Categories’, rather (since it was) an introduction to the study of logic, (it) was... an introduction to philosophy--and hence accidentally an introduction to the ‘Categories’." ↑ O'Connor and Robertson, "Porphyry Malchus"
↑ Of his 《Adversus Christianos (Against the Christians)》 in fifteen books, only fragments remain, as quotations adduced in order to be refuted in early Christian texts. 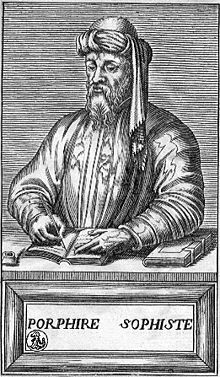 See Letter of Constantine proscribing the works of Porphyry and Arius, 〈To the Bishops and People〉, in Socrates Scholasticus, 《Historia Ecclesiastica》, i.9.30-31; Gelasius, 《Historia Ecclesiastica》, II.36; translated in Stevenson, J., (Editor; Revised with additional documents by W. H. C. Frend), 《A New Eusebius, Documents illustrating the history of the Church to AD 337》 (SPCK, 1987). In it, he famously is quoted as having said, "The Gods have proclaimed Christ to have been most pious, but the Christians are a confused and vicious sect." 위키미디어 공용에 포르피리오스 관련 미디어 분류가 있습니다.